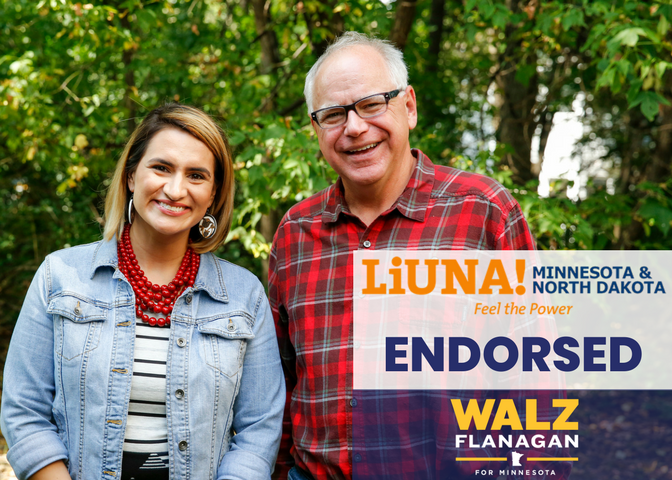 LIUNA Minnesota & North Dakota, Minnesota’s infrastructure union of more than 12,000 skilled construction and blue collar Laborers, today announced its endorsement of Tim Walz for Governor & Peggy Flanagan for Lt. Governor. LIUNA Minnesota & North Dakota is one of the state’s largest and most politically active unions. “Minnesota workers deserve leaders who stand up and fight for working people, our jobs, values and priorities. We can count on Tim Walz & Peggy Flanagan to create family-supporting jobs and to invest in our local infrastructure”, said Tim Mackey, LIUNA Minnesota & North Dakota President & Business Manager. John Pecinovsky, a Construction Superintendent with Rochester-based Benike Construction and member of LIUNA Local 405 (Rochester, Red Wing, Winona & Austin) said, “As my representative, Tim Walz has focused on bread-and-butter issues and making a difference in people’s lives. He connects with people. He’s one of us.” John lives in Winona. “We can count on Tim & Peggy to prioritize a comprehensive and dedicated transportation bill for roads, bridges and transit that will strengthen and expand Minnesota’s transportation system for the 21st Century”, said Janelle Ide, a member of LIUNA Local 1091 (Duluth). Janelle is a Laborer who lives in Duluth and works mostly for Lametti & Sons, Inc.
Joe Fowler, LIUNA Local 563 (Twin Cities Metro, Mankato, Saint Cloud & North Dakota) Business Manager said, “Walz & Flanagan will ensure that renewable energy projects create high-quality local jobs for local workers in Greater Minnesota.” Joe lives in Big Lake. “We cannot let the big corporations and CEOs do to Minnesota workers what they have done to Wisconsin workers. We are going to do everything in our power to make sure our members and the people of Minnesota understand: It’s Walz or Wisconsin”, said Mackey. Chartered in 1968 by the Laborers International Union of North America (LIUNA), LIUNA Minnesota & North Dakota, a.k.a. Laborers District Council, is based in Saint Paul. The District Council is governed by an Executive Board and Delegate Assembly and serves the members, families and retirees of five Local Unions in Minnesota & North Dakota: Local 563 (Twin Cities Metro, Mankato, Saint Cloud & North Dakota); Local 405 (Rochester, Red Wing, Winona & Austin); Local 1091 (Duluth); Local 1097 (Virginia); and Local 363 (Public employees). ATTENTION EDITORS and REPORTERS: Interviews with these and other LIUNA members can be scheduled with Kris Fredson at 651-235-4459 or [email protected]. For more information, please visit https://www.LIUNAMinnesota.org or find LIUNA Minnesota & North Dakota on Facebook.